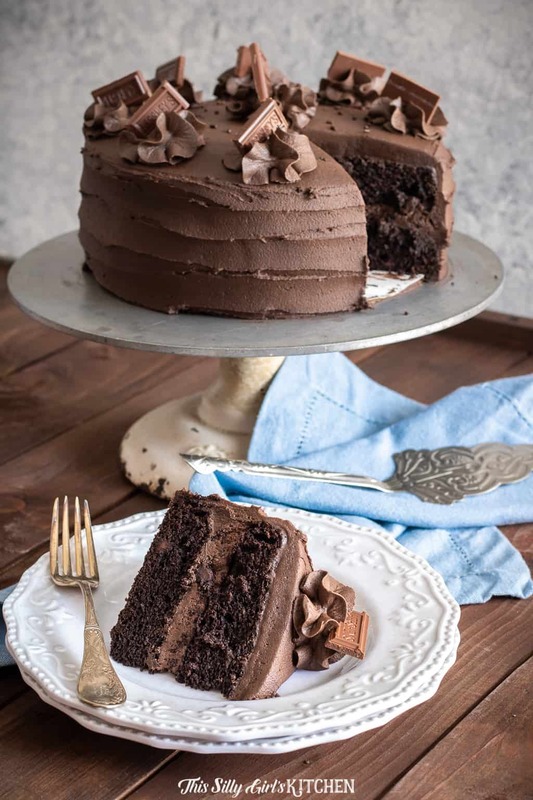 Chocolate Layer Cake, rich chocolate cake with chocolate frosting, the classic! 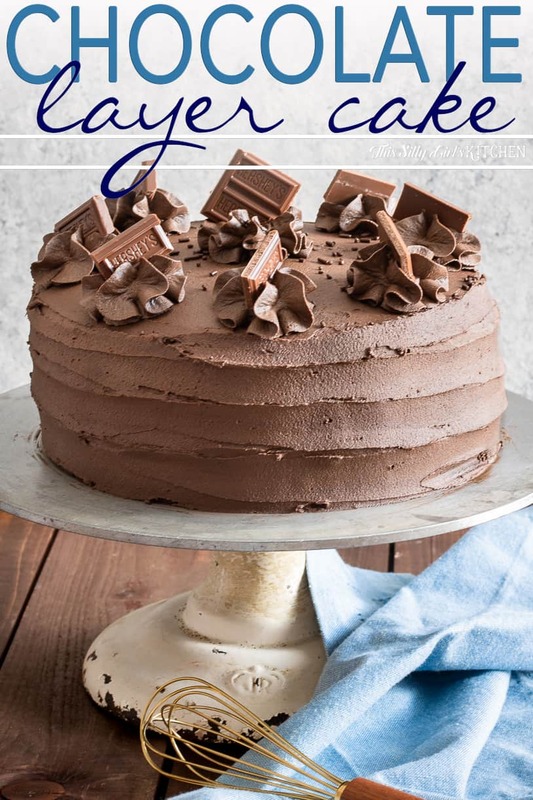 Your friends and family will be asking for this chocolate layer cake recipe. If you all remember in my Chocolate Chip Muffins video I mentioned a little surprise coming for my blog’s anniversary. Well, here it is my friends, this epic chocolate layer cake! 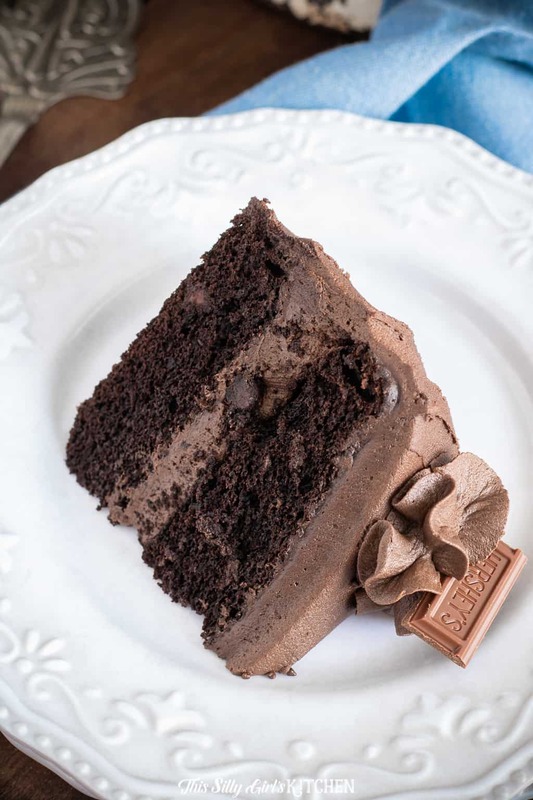 Two rich yet moist chocolate cake layers frosted with an addictive chocolate frosting. 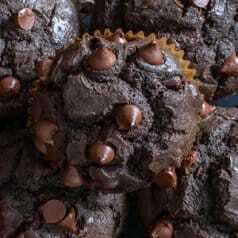 If you are a chocolate lover (like me! ), then this is the ultimate layer cake recipe for you! Yes, my friends, it is our anniversary month! Holy cow, I cannot believe it (I especially cannot believe how fast this year has flown by… August already?!)! This Silly Girl’s Kitchen has been going strong for six years now… SIX! If you have been visiting here since 2012, please leave a comment below, you the real MVP! 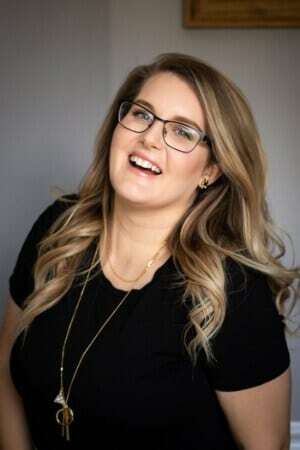 When I first started this blog as a little hobby, I had NO IDEA it would become what it is today. 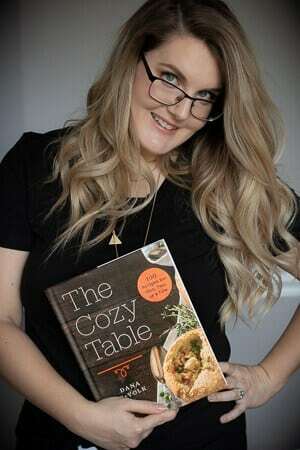 Because of you all, I have had my wildest dreams come true, including writing my cookbook, The Cozy Table! I just wanted to say a little thank you, I truly wouldn’t be able to live my dream every day if it wasn’t for my dedicated readers! So, naturally, I wanted to celebrate with a little chocolate – can you blame me?! One little secret to this chocolate cake is the addition of cream cheese in the cake batter. Yes, definitely different than the norm but it gives such a nice richest to the flavor! 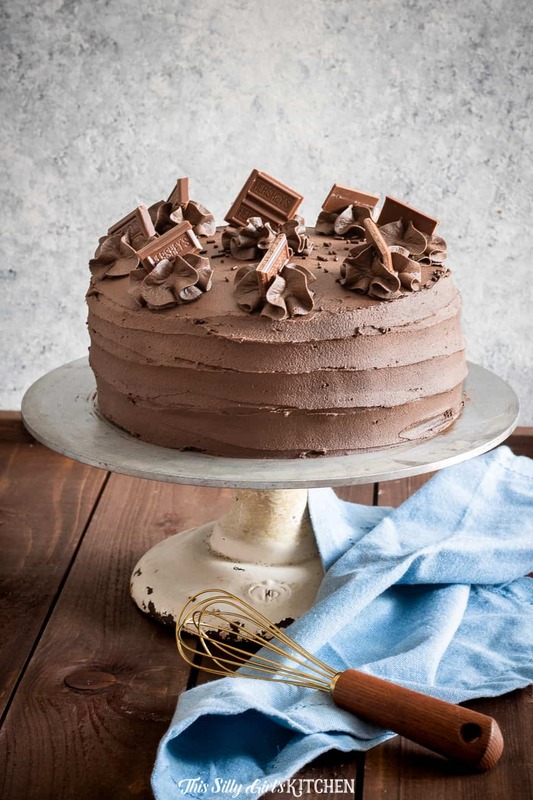 You can totally decorate this cake however you want, I added the little chocolate bars on top because I used Hershey’s special dark cocoa powder in the mix. Feel free to use whatever cocoa powder you prefer. This is just my favorite (and, not sponsored!). First, make the cakes in advance. Bake, and let cool completely. You have to make sure they are completely cooled before frosting. 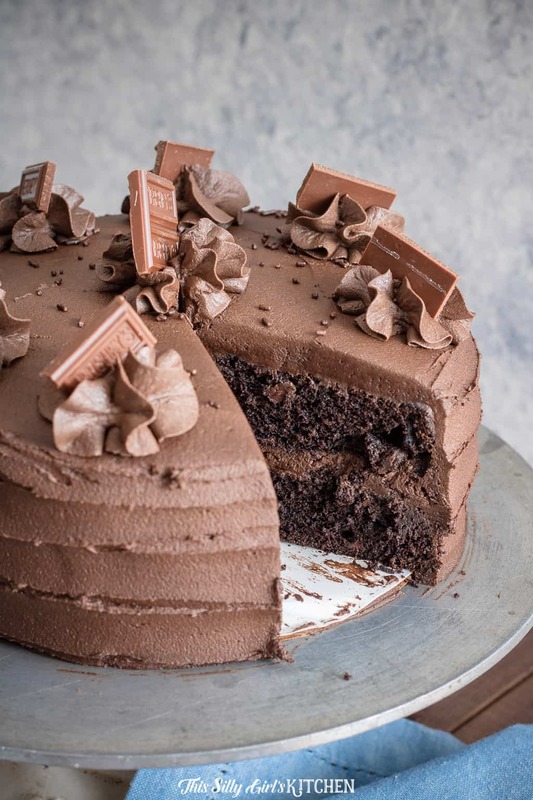 Once they are cooled, make this epic whipped chocolate frosting from my friend Liv at LivForCake.com, hey girl! Next, assemble the cake by placing one of the cakes top side up on serving board of your choice. I suggest adding a dollop of frosting right onto the board and then placing the cake on top so it doesn’t move. Add 1/3 of the frosting and smooth out entirely over the top of the cake. Next, take the other cake and place it top side down, to ensure the top of the cake is completely level. Add a crumb coat and place in the fridge for about 30 minutes to set. Frost the cake completely and add decorations of your choice, enjoy! If you need more chocolate in your life, make my Chocolate Peanut Butter Overload Sandwich Cookies, Baked Chocolate Chip Donut Holes, and Golden Oreo White Chocolate Cheesecake Bars! 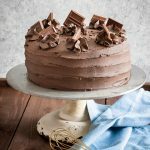 Chocolate Layer Cake, rich chocolate cake with chocolate frosting, the classic! Preheat the oven to 350 degrees. Grease two 9-inch round cake pans. Line the bottoms of the pans with parchment paper. Set aside. Into the bowl of a stand mixer, sift together the cocoa powder and cake flour. Add to the bowl the sugar, baking soda, and salt. Stir to combine everything with the paddle attachment. Add the eggs, butter, cream cheese, and vanilla into the bowl until combined. Scrape the sides of the bowl as needed. Take the bowl off the mixer. 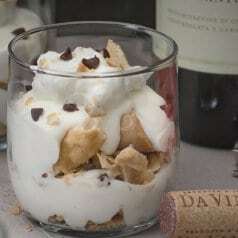 Stir in the water and chocolate chips by hand until smooth. Divide the batter evenly between the two cake pans. Bake for 20-23 minutes until a toothpick inserted into the center comes out clean. A few crumbs are okay, but any wet batter means it needs to bake longer. Place on wire rack to cool for 15 minutes in the pans. Take out cakes and let cool completely on the wire rack, at least one hour. In the bottom of a stand mixer bowl or large bowl with an electric hand mixer, cream the butter until smooth. Whisk together the cocoa powder and powdered sugar in a separate bowl, slowly add the mixture into the butter a little at a time until incorporated. Scrape the sides of the bowl as needed. Slowly add the heavy cream one tablespoon at a time so it doesn't splatter. Add the vanilla and whip on medium speed for 3 minutes until light and fluffy. Stir in the melted chocolate until combined. 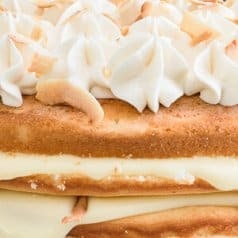 On the decorating surface of your choice (a plate, or a cake board), add about a tablespoon dollop of frosting on the center. Place one of the chocolate layer cakes top side up. Add 1/3 of the frosting and smooth over with a spatula. Add the second cake layer, top side down so the top will be level. Add a thin crumb coat all over the cake with the spatula. Pay attention to the sides where the cake comes together if there is a gap fill it in completely so the cake is even all over. Place in fridge for 30 minutes to set. Add another thicker layer of frosting to the cake, decorate as desired, cut, and enjoy!